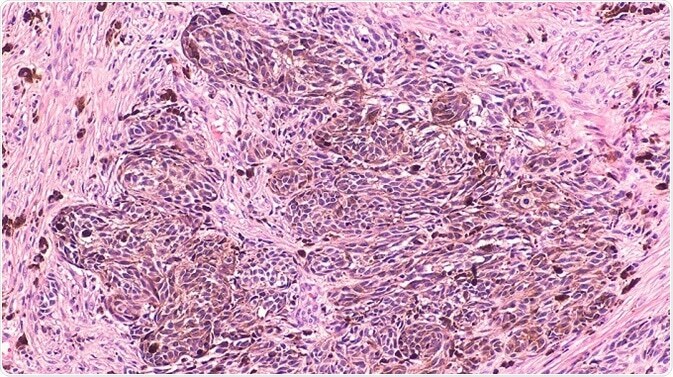 Melanoma is a destructive form of skin cancer and treating advanced-stage melanomas is difficult due to the fact that tumors develop resistance to most of the therapies at this stage, including drugs targeting oncogenic BRAFV600E. Moreover, strong responses to immune checkpoint therapies are observed in only one-third of melanoma patients. Receptor-tyrosine kinase (RTK) mediated resistance to BRAF and BRAF/MEK therapy has been clearly elucidated in patients’ tumor samples and in vitro models. However, how tumor stroma/microenvironment serves as a source of growth factors in therapy resistance still remains a mystery. Apart from targeting tumor cells, it has been proposed that targeting infiltrating fibroblasts present in the tumor microenvironment (TME) is a novel approach to treat melanoma. Earlier studies propose that an active interaction between fibroblasts and melanoma cells promotes tumor growth and therapy resistance. In addition to fibroblasts, immune cells such as B cells, T cells, macrophages, and neutrophils are also present in the tumor stroma. Cross-talk between malignant and immune cells happens either directly through cell–cell interactions or by soluble mediators such as cytokines and growth factors. The presence of melanoma-infiltrating T cells is correlated to a favorable prognosis, but the importance of tumor-infiltrating or tumor-associated B (TAB) cells is not well documented. TAB cells account for up to ~33% of all infiltrating immune cells and their frequency can be correlated to a better prognosis in primary melanoma, as well as to shorter overall survival (OS) and increased metastasis. The presence/level/activity of TAB cells is associated with increased angiogenesis and inflammation in murine melanoma models. Inflammation is caused by STAT3 signaling in tumors and inflammatory cytokine production. Squamous and pancreatic adenocarcinoma models link B cells to malignant transformation and inflammation. In these models, chronic malignant transformation and inflammation was mediated via activation of macrophage or myeloid cells by immunoglobulins in the B-cell rich tissues. Inflammation and transformation to castration-resistant carcinomas are promoted by B-cell-derived lymphotoxin in a prostate carcinogenesis model. These convincing studies in mice and the widespread presence of B cells in human melanoma and other types of cancer prompted the researchers to study their functional significance in metastatic melanoma. In the current study, the cross-talk between tumor cells and B cells was studied and the researchers found whether and how drug resistance and associated tumor cell subpopulations are induced by this cross-talk. Human cancer samples were also analyzed for the existence of known mechanisms and then, B cells were evaluated in therapy-resistant metastatic melanoma patients as part of a small clinical pilot trial. The study investigates an important mechanism of TAB-cell-mediated resistance to MAP kinase inhibitors with vital clinical implications. Also, how the TME modulates normal cells to improve tumor cell survival is highlighted in the study. Automated quantitative cytometry was performed using the digital TissueFAXS imaging system to read tissue array slides. Tissue Quest image analysis software (TissueGnostics, Vienna, Austria) was used for data analysis. Slides, smears, cytospins, and tissue microarrays were scanned and analyzed using the TissueFAXS PLUS, which is an upright fluorescence and bright-field system equipped with the TissueQuest/HistoQuest or StrataQuest PLUS image analysis software. Compared to other TG upright systems, TissueFAXS PLUS has the most versatile configuration. The TissueFAXS PLUS is capable of scanning and analyzing samples on slide-based sample containers and slides in both epifluorescence and brightfield modes. Supplementary components can be incorporated into the TissueFAXS PLUS for contrast microscopy methods, like differential interference contrast (DIC) microscopy in brightfield. The TissueFAXS PLUS can scan 10 channels in epifluorescence if it is fitted with a maximum of 10 single bandpass filters or more if it is equipped with multibandpass filters. The study presents a drug resistance mechanism in melanoma that is induced by B cells from the TME. Tumors constitutively produces FGF-2, which causes B cells to generate cytokines and inflammatory factors, particularly IGF-1. The cross-talk that ensues causes melanoma heterogeneity and resistance to kinase inhibitors. In spite of the presence of high infiltration of B cells in colon, breast, prostate, lung, skin (melanoma), and ovary cancer, the role of B cells in the progression of cancer remains largely unknown – unlike T cells. The few reports available give ambiguous views regarding the role of TAB cells and cancer progression. TissueGnostics (TG) is an Austrian company focusing on integrated solutions for high content and/or high throughput scanning and analysis of biomedical, veterinary, natural sciences and technical microscopy samples. TG has been founded by scientists from the Vienna University Hospital (AKH) in 2003. It is now a globally active company with subsidiaries in the EU, the USA and China and customers in 30 countries. The TG systems offer integrated workflows, i.e. scan and analysis, for digital slides or images of tissue sections, Tissue Microarrays (TMA), cell culture monolayers, smears and of other samples on slides and oversized slides, in Microtiter plates, Petri dishes and specialized sample containers. TG also provides dedicated workflows for FISH, CISH and other dot structures. TG analysis software, apart from being integrated into full systems is fully standalone capable and supports a wide variety of scanner image formats as well as digital images taken with any microscope. TG also provides routine hematology scanning and analysis systems for peripheral blood, bone marrow and body fluids. How is Voluntary Hand Movement Influenced by Neural Contributions?